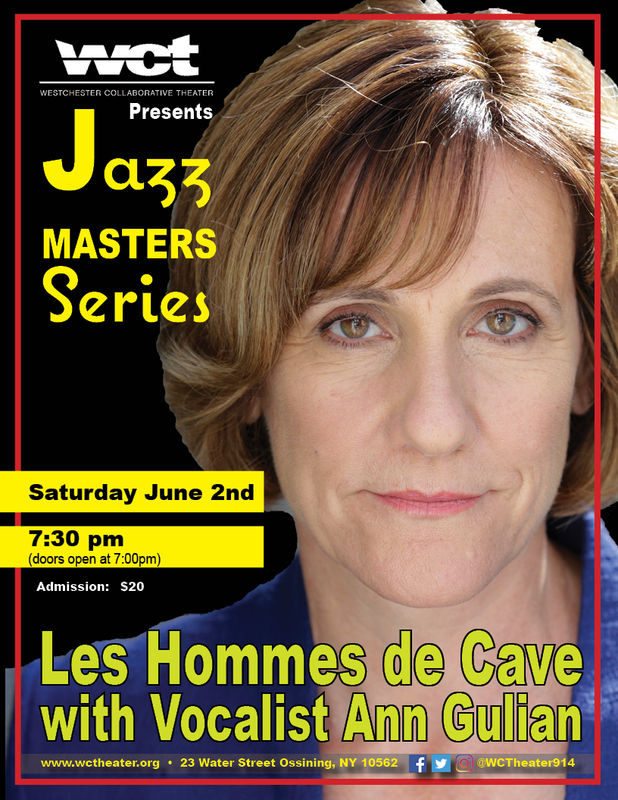 WCT presents Les Hommes de Cave on June 2nd as part of the 2018 Jazz Masters Series. Roll away the stone! Les Hommes de Cave bust out with big brass: baritone sax and trombone up front - backed by a rock-solid ryhthm section to lay down Jazz Standards and American R& B. Vocalist Anne Guilan joins in to cover some American Song Book classics and round out a complete evening of music. Les Hommes de Cave, a five-piece band, performs edgy mainstream jazz that mixes classic standards with influences from Haiti, Brazil and American R&B. The members are Philippe Charles on bass; Graham Gulian on drums; Rik Kaufman on piano; Jeremy Kattell on Sax; and Dan Williams on trombone, featuring Ann Gulian as vocalist. The core rhythm section developed a loyal following at the now defunct One Station Plaza performance space in Peekskill in the late 90’s. While Charles, Graham Gulian and Kaufman first performed together in the 1970s, the group expanded in 2005, and now explores a broad range of music through the lens of be-bop and post be-bop traditions. The recent addition of singer/songwriter extraordinaire Ann Gulian has enabled the band to broaden its repertoire even further to include a variety of rarely heard selections from jazz and pop songbooks.